Editor’s Note: The following story was written by a student in our Urban Youth International Journalism Program in partnership with the Chicago branch of Spark. The UYIJP is generously funded by the McCormick Foundation. Albert and Marianne, a couple from Chicago, spend about $80 a year on LEGOs a couple times a year and keep what they build on a shelf. But that’s nothing compared to Albert’s cousin, who has a whole LEGO city in his basement. I met Albert, 28, and Marianne, 30, at the LEGO Store in downtown Chicago. They have only been building LEGOs for about a year, but they love them. The Lego Store was filled with people like Albert and Marianne when I visited it in October. Alison, a 23-year-old employee there who is fromUtah, told me that Lego’s were famous the world over and had been around since 1932. They were invented by a man named Ole Kirk Christiansen. That made me wonder: What would give someone the idea to invent LEGOs? On Oct. 15, 2014, in an interview at the LEGO store, located in downtown Chicago at the Water Tower building, Josh the supervisor shared great information about the Skyline Lego display in the storefront window. Josh is 24 years old from out of town who attends school here in Chicago. He loves building LEGOs and he has been building LEGOs for 19 years. Josh said that the store has a team of master builders who build the displays on site. Josh likes building his own LEGO creations and does not have a favorite LEGO set. Josh is working right now on a Tiki Bar creation. What is a Perfect Community? Editor’s Note: The following story was written by a student in our Urban Youth International Journalism Program. The UYIJP is generously funded by the McCormick Foundation. What is a perfect community? How do we really define a perfect community? From the Black perspective, a perfect community is a community with: No violence, no liquor stores owned by non-African Americans, and also people who are working within the community for the people with local business, shops, clothing stores, groceries, parks, schools, etc. Unfortunately, from my perspective, this cannot happen first of all because Black people like to stay stuck in a reality shown to them by the media. Black people and various other races live by what the media tells them is the “truth.” Second, Blacks are always in competition against others to prove that we are worth something. These things hold us back and keep us from achieving our collective goals. When I think of the perfect community, the first thing that comes to mind is peace. In my perfect community, there would peace among every brother and sister; not just African Americans but every culture. We would be blind to color, because color would not matter in my community. It would be equal opportunity and the word minority wouldn’t exist. We would unify each other in every aspect. No brother or sister would stumble alone. African history would be taught in our schools, not just European history. Our children will learn their roots from an early age. It has taken me 21 years to learn my roots and who I am really. In elementary school, my teachers didn’t teach me about Egypt. I was taught European, German, French and Korean history. I didn’t learn about El-Hajj Malik El-Shabazz until I was in eighth grade; and as far as I can remember, most teachers didn’t teach about Malcolm X because of his past years in prison. Growing up, I have only learned of Dr. King and Rosa Parks; respect is all due to them, but they are not the only Black leaders. Children pose with Santa Claus at the Christmas Toy Drive sponsored by Social Sound Production & Entertainment Social Movement. Photo by Treanna Frencha. 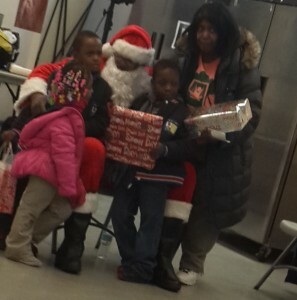 The first annual Christmas Toy Drive at Hamilton Park, located at 513 West 72nd Street, was held by Social Sound Production & Entertainment Social Movement. The toy drive was an overall success! There were refreshments (cupcakes, chips and juice boxes) for the children to enjoy after they waited to take a picture with Santa and receive their gift. The kids and their parents had to make a line outside, and then were sent in five at a time to sign a form and sign-in sheet so they can be reached after the event. This is way Social Sound Production & Entertainment Social Movement can build a relationship with the families they helped. Once they filled out the forms, the children were sent to different tables, depending on their age, where they received a gift. After getting their gift, it was time to take a picture with Santa and other family members. People can give back to their community by seeing what is needed in that particular place. They can find a way to help fulfill the need of that particular community by getting personally involved. Say, for instance, the community needs a new basketball court; the people living there could hold a fundraiser selling items they know others will buy. It doesn’t have to necessarily be junk food (chips and Candy), but they can sell healthier alternatives (vegetables, fruits and nuts). They can even sell home made items (thank you cards, jewelry or clothes) at a reasonable price. These are things people like and will purchase, thereby raising the money for the court. 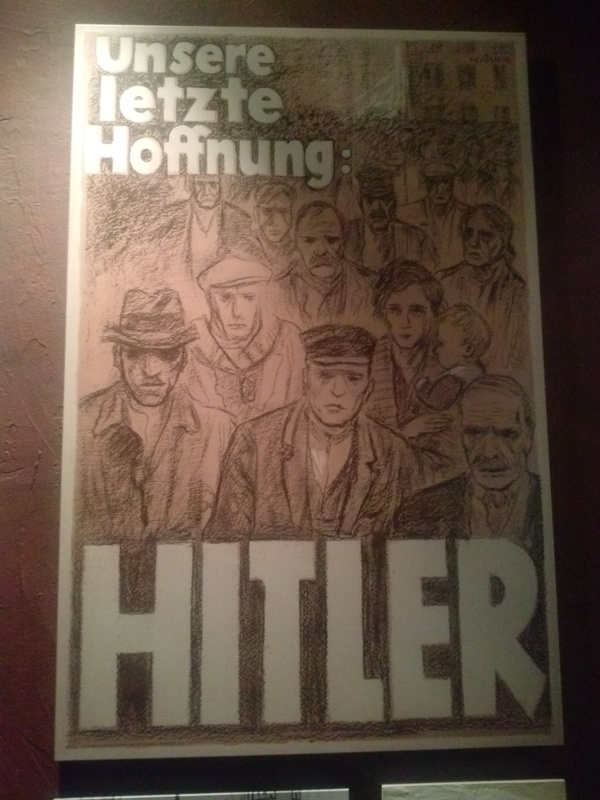 A pro-Hitler poster used as part of the Nazi propaganda display in “State of Deception,” a travelling exhibit from the U.S. Holocaust Museum that was at the Field Museum last year. Photo by Devin Belcher. Editor’s Note: The following story was written by a student in our Urban Youth International Journalism Program in partnership with the New Memorial Baptize Church. Students participated in a field trip to see “State of Deception,” a traveling exhibit from the U.S. Holocaust Memorial Museum. The UYIJP is generously funded by the McCormick Foundation. My experience at the Holocaust Exhibit “State of Deception: The Power of Nazi Propaganda” was educational and the information I learned was disturbing. The Field Museum hosted the exhibit in February 2014 and I knew it was important information, but I thought a majority of people knew about the events leading up to the Holocaust. I also thought with all the facts and information about the Holocaust being shared over the years, people would have a little sympathy for the victims and their families, especially after seeing videos, pictures, or hearing survivors tell their stories. This exhibit opened my eyes to knowledge that we haven’t learned in school yet. Adolf Hitler was responsible for an estimated 5.1–6.0 million Jews being killed. He used propaganda to convince German men, women, and youth that Jewish people were not as important as the German race. Hitler tricked the Jews into sending their children to the concentration camps where Jewish people were starved, killed, and enslaved. Editor’s Note: The following story was written by an advanced student in our Urban Youth International Journalism Program. The UYIJP is generously funded by the McCormick Foundation. I had to register at Malcolm X College for the fall 2013 semester to continue my educational career towards becoming a paramedic. I do not care for the registration process because it takes a long time. After purchasing my books, taking my ID picture and getting my class schedule, I stood in this gigantic line waiting to get my U-Pass for the Chicago Transit Authority (CTA). That was the last time I’ll have to go through that process. That’s because like all of the city, the City Colleges are transitioning to the Ventra pass for riding the CTA. The Ventra pass for students is a blue card with your picture and a magnetic stripe on it. The way it’s supposed to work is you hold it in front of the machine and it automatically reads it and gives you the “go” signal. If there’s a problem, you get a red signal. Am I Prepared for College? 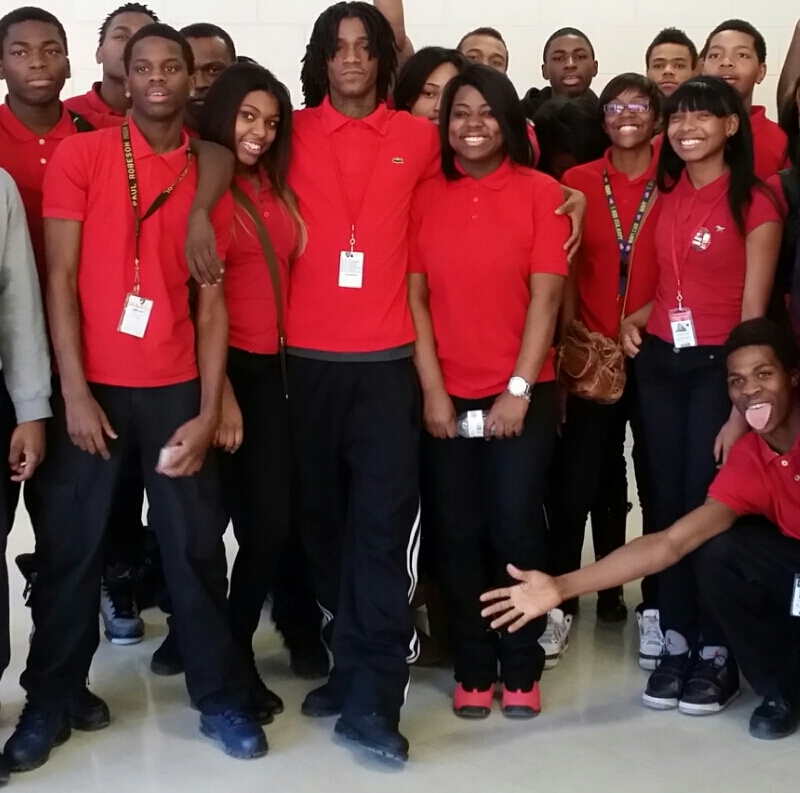 Students at Paul Robeson High School. Photo by Tatiana Minters. Editor’s Note: The following story was written by a student in our Urban Youth International Journalism Program in partnership with Paul Robeson High School. The UYIJP is generously funded by the McCormick Foundation. “I don’t like this school, Robeson is boring, class is boring, and teachers are boring, they are teaching baby work and stuff that is not on our level or getting us ready for college.” said Jameesha Shields, 17, a senior who has been at Paul Robeson since her freshman year. My name is Tatiana Minter and I’m a senior at Paul Robeson High School. Paul Robeson High School is a 4-year school located in the Englewood neighborhood on the South Side of Chicago, Illinois. It mainly is fully of African American students and a mix of African American and white teachers. Seems like every time I say ‘Paul Robeson,’ the first thing that comes out of someone’s mouth is “Why you go to that school?” or “It be crackin’, don’t it?” I know Robeson has a bad reputation with many people who don’t even attend the school but since I do, I thought it would be a good idea to tell my story and those of my classmates. I am a senior at Paul Robeson’s High School, and I am a member in Robeson’s poetry group started by Ms. Twine the poetry coach we call Endless Words. I joined the group Endless Words January 30, 2014 and we talked about upcoming events. But in order to be a part of the event you had to recite a poem to the poetry coach Ms. Twine. Ms. Twine needed to hear a recited poem because one of the events was scheduled three days after the practice day. So we only had a day to write the poem and one day to practice the poem, which she wanted us to memorize. The event was called “Louder than a Bomb”. Louder than a Bomb was held at Columbia College in Chicago at 2 p.m. 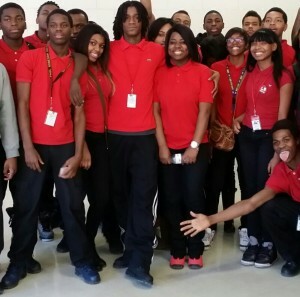 It was a small auditorium and our group, Endless Words, was competing against other schools like Simeon and Harper. There was a DJ playing music and then a speaker came up to tell us some rule. Points were taken off for profanity but the space is supposed to be like your living room, so we were encouraged to be comfortable, but to please respect the microphone. A member from each competing group had to come up and pull a card with an alphabet on them to determine the speaking order. Our group was second to speak. I was last to go out of our group and it was very nerve-wracking. I walked upon the stage and looked at the judges, and then I noticed every pair of eyes in the room was on me. My heart dropped while there was total silence. I tapped to check the microphone; I took a deep breath and spoke.